, with Reserved Font Name: “League Gothic”. We found this font family on http://www.theleagueofmoveabletype.com downloadable with the SIL OFL license. 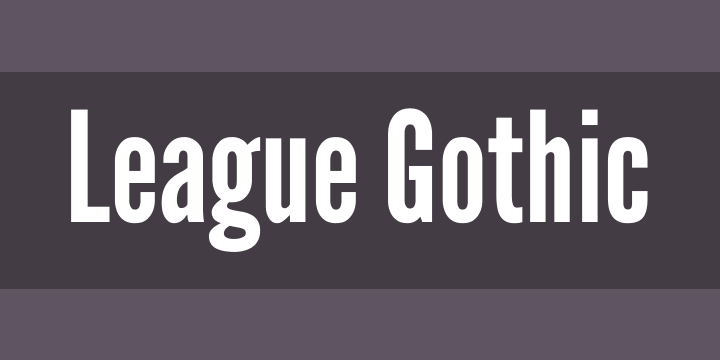 League Gothic is a revival of an old classic, and one of our favorite typefaces, Alternate Gothic No.1. It was originally designed by Morris Fuller Benton for the American Type Founders Company (ATF) in 1903. The company went bankrupt in 1993. And since the original typeface was created before 1923, the typeface is in the public domain. We decided to make our own version, and contribute it to the Open Source Type Movement. It’s free, not only in price, but in freedom. Image and text courtesy The League of Moveable Type.